There is a bewildering choice of table tennis rackets available in the market. 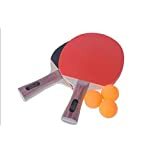 But it is very important to make the correct choice since it is a very important component of table tennis equipments. These rackets are generally used to hit the table tennis balls and send it to the opponent situated on the other side of the table. The tactical challenges posed by this task increases mental alertness and the ability to concentrate. Improved reflexes, better muscle movement, capability of taking decisions quickly are of the other benefits associated with this racket game. The best table tennis rackets are characterised by a flat and rigid blade made essentially of natural wood. The blade can be held with the help of a wooden handle. The dimensions of the blade are approximately about 15cm in width and 25cm in length, including the handle. Rubbers of two different colours are affixed on the two sides of the racket blade with the help of speed glue.